We ship our products in either used cardboard boxes for flat pack and partially assembled products, or on pallets for large and fully fabricated items. Re-using cardboard boxes is even better than using recycled cardboard, as it saves delivery costs, manufacturing costs, energy costs and reduces the pollution associated with all of these. Where possible we ship all our goods using a next day carrier. If the product is too bulky, or if your order quantity is large enough, your order may need to be sent on a pallet. If the goods are sent on a pallet and are less than 2 metres in length they can usually be unloaded from the delivery vehicle using a tail lift. If the pallet is longer than 2 metres or in other exceptional circumstances, the pallet will need to be unloaded using unloading equipment such as a fork lift truck. It is the customer's responsibility to provide this equipment. Alternatively, the goods can be hand-balled off, but again it is the customer's responsibility to do this. If you wish to discuss your delivery requirements with us, please call on 01282 861325. Where we have products in stock we aim to deliver all goods in 3–5 working days. Next day delivery for items in stock is available at extra cost. Please call 01282 861325 to book this service. If goods need to be sent on a pallet we aim to deliver in 5–7 working days. Fabricated items such as furniture, including benches and picnic benches may take 10–14 working days. We inform you by email when your goods are dispatched. Customers who wish to collect the goods to avoid shipping charges can do so by contacting Kedel Limited on 01282 861325. Please note that we are only open for collections on Monday-Friday 9:00am–1pm and 2pm–4.30pm. Please give us 3 days notice before collecting your goods – if you do not give us sufficient notification we cannot guarantee that the goods will be ready for collection. If the goods require fabrication please allow 7-10 days for them to be manufactured, we will contact you to tell you when they are ready for collection. We will always try to contact you before shipping your goods to make sure you can receive them at the time they are likely to be delivered. The precise shipping charge is shown when a product is put in the basket and is based on weight of goods and dimensions. Delivery costs can often be reduced if planks and beams etc. are cut to shorter lengths - call for advise if shipping seems high and you are happy to have shorter lengths. We only charge what it costs us to ship your goods. If the delivery is late or has not turned up and our carrier has not contacted you, please contact us on 01282 861325 and we will sort it out directly with them. We ask all carriers to call you one hour before delivery though this cannot be guaranteed. If you are missing part of your delivery or if your goods are damaged in any way please contact us immediately and ensure that you have marked the delivery as being incomplete with the carrier on receipt. Missing goods will be sent as soon as possible. 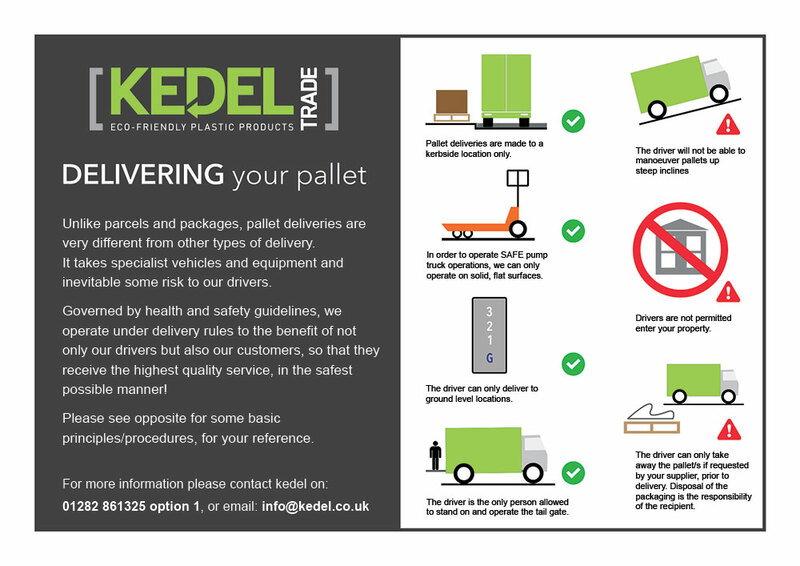 Damaged goods will need to be returned to Kedel Ltd. Please check the goods to ensure that they are acceptable as soon as possible. If they have been found to be incorrect, damaged or faulty, please notify our office within 48 hours, and give written notification either by email or post, including details of the defect and photographs, within 5 days of receipt of the goods. After examination of these details and if we accept liability we will arrange for collection and replacement, or a full or partial refund. We will accept returns of goods which are not faulty and which are surplus to requirements within 7 days provided they are returned in good condition at the customer’s expense. We will refund the value of the goods less the initial cost of shipping, and less a handling charge of 20%.